This photo was taken c1920, it shows some of the girl swimmers of the Shiverers Swimming Club Hove, My mother is second from the right and her younger sister is fourth from the right. It is a lovey photo. Which row is your mother in? I can see the name Rose. How old were they? I wonder what the policeman was doing there?…and who was the chap with the peaked cap? My Mother ( Dolly) Mary and her sister (Rose) Rosalind Marsh are in the front row, their ages were around 10 & 11 at the time the photo was taken. I don’t know who the man in the peaked cap was, I’m sorry I don’t know anymore about it. I go to that swimming club and I am amazed that it has been going for sooooooooooooo long! Marion, I am a teacher at the club, do you or anyone else have Shiverers memorablia, and can we use your photo on our club website? Patricia, of course you can use the photo on your website. I’m sure if my mother was still alive she would have been very proud that you would want to use it. I’m afraid I have only got a few photos of my mother, her sister & their Shiverers friends. Swimming is in our blood as you can see if you look at the page on ‘Hove Swimming Club Water Polo Team 1896’ under Local Folk featuring my mother’s grandfather William Marsh. My sister used to swim in the school sports for Pelham Street School during the 1950’s & swimming was the only school sport that I liked and was any good at! I was very interested in the photo as I’m looking for information relating to my mother when she was a member of the Shiverers. However your photo is too early as my mum’s era would probably be between 1930-40. With regards Patricia Willis’ comments I do have a medal that my mother won in 1934 in an “Girls Under 16” race. I remember one very cold winters morning (February) and there was thin ice on the water and members of the Shiverers Club were in the sea swimming around. I was about 11 years at the time and I went in to the sea with them. I think it was warmer in the water than out. Icy wind blowing. I got a dreadful cold and was off school for a few days. Hi Geoffrey: as a member of the BSC 1959/1964, I remember Dave West. He use to train with us, and was a top swimmer. In the summer-time Dave and I used to go to the Black Rock pool, and because he was of dark complextion sun bathing was no problem. Dave would turn black while the rest of us would blister! I think Dave went on to play water polo for England. I recently asked Snowy Walder also of BSC the whereabouts of Dave West, but nobody has seen him for years. I’m in Australia now. My mother was a Shiverer sometime between the wars, possibly in the 1930s. I remember she told me that she used to take part in the pier to pier race between the West and Palace Piers. Does anyone else know about this race? I was a Shiverer and still have a wooden plaque from 1961 when I was in the under 14s breaststroke. My brother was in the club before me but, had left by the time I joined, his name is Alfred. I remember Dave West, his mum and dad used to teach us. I still swim, an instructer asked me recently if I had been taught as I have a perfect stroke, so that can’t be bad at 61! It also shows what good teachers we had. When I worked for Heating and Vent in the early 60s, two of my workmates were Shiverers. Jimmy Funnel was one and another one whose surname was Churchill. I can’t remember his first name. The person I remember most that was a member of the Shiverers in the late 60s was my best mate and school friend Peter Baxter, who also swam for our school at the King Alfred baths and his speciality was the butterfly. Unfortunately Peter passed away in his early 50s from a heart attack about 5 years ago. RIP Pete. Watching the wonderful Olympic swimming has evoked memories of SSC in the 1960s – I remember Dave West and the polo boys, the Franklins, the Dunnes. It was a great club, everyone mixing together from different backgrounds. My moment of glory was swimming for Sussex, 1966 – I came last, I think, but still proud. To Dave Sanders – I too remember Peter Baxter, he was a year older than me when I was at the Shiverers. Sad to hear he’s gone. I remember the Sunday afternoon training sessions with Phil Dunne driving us harder and harder – and then the coach trips to the galas – somehow, the coaches always smelled of sandwich spread. My dad, Cliff, became a time-keeper and my mum, Bunty, taught the Shrimps to swim. Quite strange to think I was actually competing with people who ended up in the Olympics – I coulda been a contender – apart from the lack of skill, dedication and taking up smoking and chasing girls! Hi Janey! 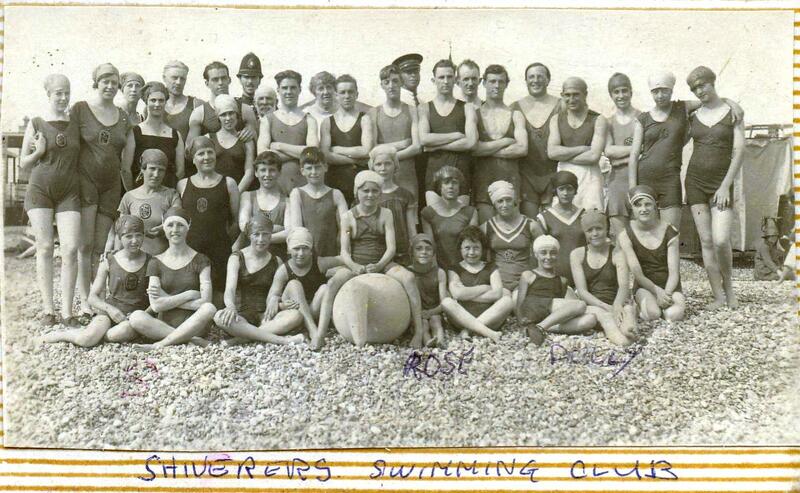 I was a boy member of the Shiverers S.C. during the 2WW: we used a small murky swimming pool on Saturday afternoons. The pool was located between the King Alfred (a wartime naval school ) and the beach. Our coach was the renowned Carl Wooton who tho a first class swimming coach was reputed not to be able to swim! I come from one of the two well known (inter-war) Brighton ‘Taylor’ swimming families both headed by sons of Tom Taylor Senior,(my mother’s grandfather)who, with others, founded the Brighton Swimming Club. Tom Taylor Senior died of diphtheria before the age of forty! My aunt Doris Capt nee:Taylor, was a young Sussex schools’ champion at the age of fourteen and about to undertake olympic trials (in the Thames! )…when the trials were cancelled by the advent of the Great War. Doris (my mother Cissie’s sister) died in the late nineteen-nineties at the age of 96. My mother and her three sisters: Doris, Margery and Gaenor swam as a relay team at the old SS Brighton Pool in West Street…so I was told by my mother. Margery (Sanders, nee Taylor) lived to the age of 103. I and my brother Gerard were both good swimmers and members of this great club from the early 50s to the mid 50s. Others then were Charlie Carter, Lewis Whitby, John Murray, all great swimmers in their time and English schools champions with Hove Manor School, (Connaught Road), as I remember for about five years running. I still have some winners trophies from that time in my display cabinet. They were tough times with three visits a day to the King Alfred pool for hard training sessions under George Ely (a great coach and taskmaster) and then to Shiverers in the evening still wearing the same trunks, still wet through. In those days you only had one pair of trunks. Sometimes we went to the fresh water baths in North Rd Brighton – a quite different experience. They were such happy days with many memories. I still see Charlie Carter once a year and he is well but often wonder what happened to all the others. I was a member of BSC back in the 60s all the way through. i was eventually made an Honorary member for life because I had over 50 full GB caps for water polo. There was always a great friendly rivalry between Shiverers and BSC, in fact quite a few ie the Franklins, Jasper Stevens and Pete ” Budgy ” Baxter eventually joined BSC for swimming and water polo. In fact myself and a few others joined Shiverers to play polo when they were in the National League and yes I played with Dave West when he first broke into the England squad and yes he was a pretty boy whom the girls were all crazy about. I remember watching a match back in 1970 after a gala at the Aquamarina in Worthing. It was against Spain and Dave West was playing, I will never forget it as i was watching poolside. England narrowly lost and Dave almost scored, it opened up a new world for me and gave me motivation for the future. We were all really jealous cos all the best looking girl swimmers were swooning over the young tanned Spaniards. I do not know what happened to Dave West after about 1972 as he dropped out of British water polo. The last time I saw him he was coming back from London on a train as I was getting on and he was asking me how the polo was going. I remember Geoff Cervantes, a great swimmer, tanned with thick eyebrows and leopardskin Speedos. I also remember Jane Salvage as her brother Guy lived in the next road up from me in Vere Road and was one of my best friends in school and Scouts. I heard he sadly died at a young age. Jane was tall and slim with dark hair and glasses. Those early swimming and polo days were such great memories and many characters who are sadly no longer with us: Johnny Ottaway, Budgy Baxter, Ray Herraidge to name a few, memories I will cherish forever. Tom Green, Ronnie Reeves, Paul Simms, Pete Foster, and Pete Davis: not to mention Dudley Seifert and Brian Beale and Terry Long. Messrs Seifert, Beale, Simms, Davis and Foster all attended Brighton, Hove and/Sussex Grammar School as I did. Seifert and Beale were part of the 1956 all England Water Polo Championship team. I believe Tom Green emigrated with his mother to Australia and seemingly never heard from again. He swam for England with John Martin-Dye against Scotland one time and had the most technically perfect freestyle stroke I have ever witnessed. He was followed by Ronnie Reeves who was also a very talented freestyle/butterfly swimmer. I believe he also emigrated to Australia but later returned to the UK(?). One name that I also well recall was Terry Long who was part of the famous water polo championship team of 1956. Terry had a very smooth freestyle stroke and won the West to Palace Pier ( as it was known then) many times. Aaah….fond memories indeed of that SSC. In the late 50’s and early 60’s.